1> Go to media settings dialog for any image. 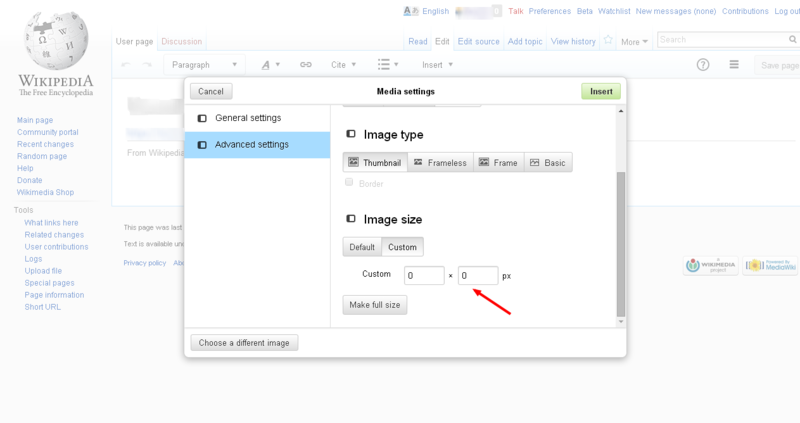 2>Go to Advanced Settings -> In Image size, click on custom and change its size to 0x0px.Notice message saying “Size values are invalid” shows up under the Make Full size button. 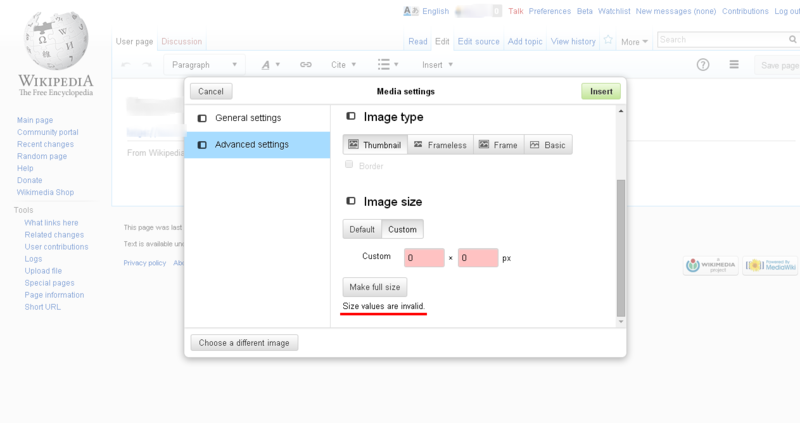 3> Now choose a different image and for that image repeat steps #2.Notice “Size values are invalid” does not show up. Also if the image size is invalid then the insert button should get disabled, preventing the user from inserting it. bzimport set Reference to bz70861. I can still reproduce this on Betalabs. Right now, if you try to input 0 , the widget just does not let you to enter it, but as soon as you type some non numeric character, it automatically sets to default size , I think both cases should have same action: set to default size. We didn't want to force an input on the user, which is why non-numeric input is allowed (but invalid.) The only problem with 0's is that practically speaking, an empty input and 0 are more or less the same, so 0 (or empty) assumes the user *meant* to say they don't want to set values -- which means they wanted to go with "default". Changing the value automatically when the user inputs a non-numeric character can be annoying if it was done by mistake. If I want to type 156 and I accidentally type 15t, it wouldn't be very comfortable to have the widget automatically make my values into default. I think that the 0-to-default makes sense, but the other behavior will be more of a hinderance to the user than help. they wanted to go with "default". Right now, it is not doing what you are suggesting here,the widget just does not let you type anything when you try to input 0 and "not" making it "default"
widget automatically make my values into default. But, this is what it is doing right now.It is changing the value automatically to default when user inputs non-numeric character.So, I suggested to have similar behavior for both cases. more of a hinderance to the user than help. It's making it default, which erases the visible values. Technically it does what I explained; practically it does what you say. It's the same thing, but different user experiences. I am not sure if it's right to change the current behavior on that, though. suggested to have similar behavior for both cases. I see what you're saying, but my point is that there's a difference conceptually between the two cases, so I think it's okay that the two behaviors are different two. When a user inserts "0" value, they likely meant for the image to have no dimensions, which effectively means it is defaulted. When a user inserts a non-numeric letter like "a" or "-" it is very likely that it's an error and even if it's not, we have no way of knowing what the user meant. Hence, we don't assume anything and instead we mark the values as "invalid". When the image size is default, inserting a non-numeric char changes it to custom.And if i keep entering non-numerics, then it gives the message "Size values are Invalid", but the "Insert" button stays active. It gets disabled only when you further make any changes to the settings. for ex-uncheck the “Wrap text around this item” checkbox or change the Image type to Basic /Frameless.Notice when any change is made to the settings then only the Insert button gets disabled and not when an invalid size is detected. Not pulled through yet, but will be.